High frequencies of densely packed modern electronic equipment turn even the smallest piece of wire into a transmission line with signal retardation, dispersion, attenuation, and distortion. In electromagnetic environments with high-power microwave or ultra-wideband sources, transmission lines pick up noise currents generated by external electromagnetic fields. These are superimposed on essential signals, the lines acting not only as receiving antennas but radiating parts of the signal energy into the environment. * a unique exposition of the increasingly popular PEEC (partial element equivalent circuit) method, including recent research results. 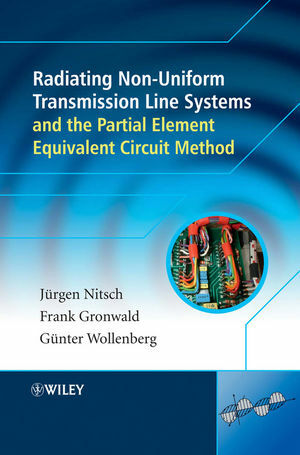 Both the Transmission Line Theory and the PEEC method are well suited to combine linear structures with circuit networks. For engineers, researchers, and graduate students, this text broadens insight into the basics of electrical engineering. It provides a deeper understanding of Maxwellian-circuit-like representations of multi-conductor transmission lines, justifies future research in this field. Since 1997, Professor Jürgen Nitsch has taught at the Otto-von-Guericke-University-Magdeburg, on the chair for EMC and Theoretical Electrical Engineering. In 2004 he became an elected IEEE Fellow for Contributions to the Analysis of Complex Systems for Electromagnetic Pulse and High-Power Microwave Applications. Professor Günter Wollenberg has been a professor at Otto-von-Guericke-University-Magdeberg since 1992 and his teaching activities are mainly focused on the fundamentals of electrical engineering, electromagnetic field theory and transmission line theory. Dr. Frank Gronwald joined the Chair of Jürgen Nitsch at the Otto-von-Guericke-University-Magdeberg in 1998 where he focussed on Theoretical Electrical Engineering, Electromagnetic Compatibility and Antenna Theory. He obtained the Habilitation Degree for Theoretical Electrical Engineering in 2006. Dr. Gronwald has been with the EADS (European Aeronautic Defence and Space Company) since 2007, where he works on Electromagnetic Compatibility and Antenna Integration for Aircraft Systems. He is a senior member of IEEE and an elected member of Commission E of the International Union of Radio Science (U.R.S.I. ).